A FINE & UNUSUAL SPANISH/SPANISH-COLONIAL MIQUELET DRAGOON-TYPE MUSKETOON (ESCOPETA), ca. 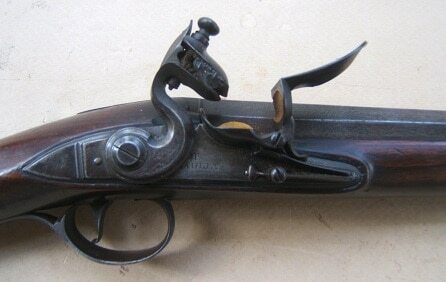 1770: In overall very fine, generally untouched original “flintlock” condition. Fine quality, 35 1/4″, Spanish-type, octagonal to round, smoothbore, band-fastened, iron, .78 caliber barrel with a top-mounted, brass fore-sight/bayonet-lug. Retains generally smooth, steel-gray surfaces with an untouched age patina, 85%+ “bright” finish and some scattered light pitting/discoloration. Molded and nicely carved, provincially made?, hardwood fullstock of “Spanish/Spanish-Colonial” (Madrid-type) form with a sculpted and fluted, buttstock with incised and raised rococo type line and floral carvings, at the barrel tang and around the furniture. Spanish Miquelet Patilla-type, lock with an untouched, steel gray age patina and in mechanically functional order with a strong mainspring and fine timing. Plain, steel and brass mounts of Spanish/Spanish-Colonial military type design: the long, flat, rectangular sideplate with its two sidebolts and its integral Dragoon type, iron, Belt-Hook-form, Saddle-Bar. Three (3), friction-fit, brass barrel bands: the rear two bands of classic Spanish slotted/pierced design and the upper band of “French-type” martial form with a double-loop configuration. A plain screw-fastened, steel, ½ type “Madrid-type” buttplate with a rounded upper finial and a sculpted rear. 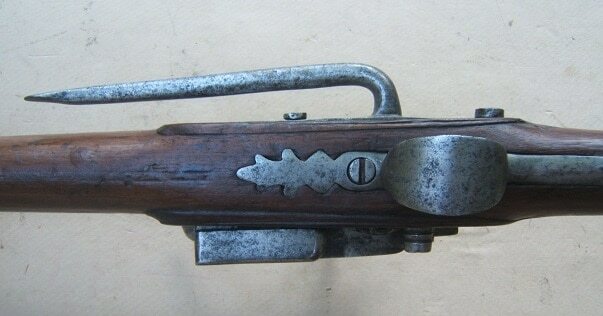 The trigger-guard with a fine bow, a rear finger-spur and acanthus leaf finials. In overall fine condition. The barrel with a smooth, steel-gray age patina, sharp contours and a very good bore and fine touch-hole. Fine stock with generally sharp contours, deeply fluted carving on the buttstock, some scattered light handling marks, 85%+ finish and some expected minor nicks and abrasions. The lock with generally smooth surfaces, some light wear, a strong mainspring and its original components: in functional order. Very good hardware with matching steel surfaces. 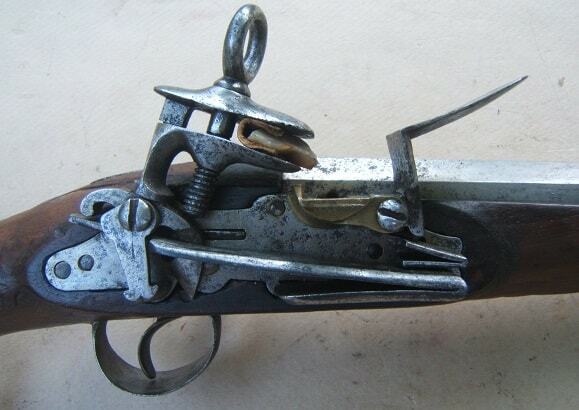 A fine example of a Spanish/Spanish-Colonial Dragoon-type Miquelet (Escopeta), ca. 1770. 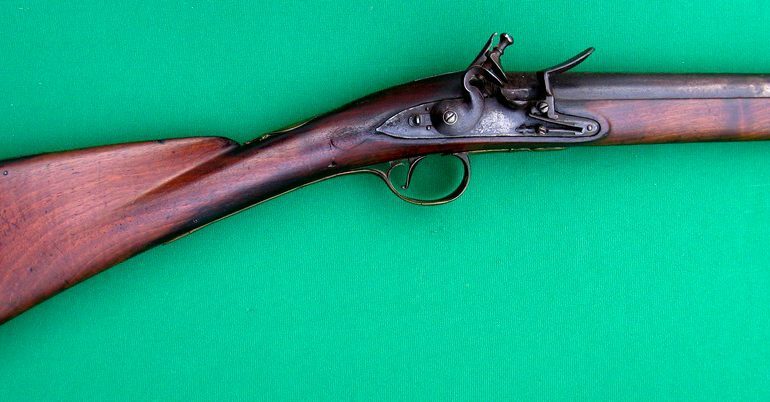 The type of long-gun used by both Spanish troops and settlers, in the New World; and similar to examples found in Florida. Original, button head, iron ramrod. Overall length, 51 1/8″. For more information, please see C. Blaire’s: European & American Arms 1150-1850 & Sydney Brinckerhoff’s: “Spanish Military Weapons in Colonial America…”.